L’inconnue de la seine is a story that captured my imagination. L’inconnue de la seine translates as “the unknown woman of the Seine”. A young woman was pulled from the Seine river, Paris in the late 1880’s. A suicide was suspected as her body showed no signs of trauma or violence. She was taken to the Paris morgue where unclaimed bodies were displayed for the public to view, in an attempt to establish their identity. At that time it was located behind Notre-Dame and was a popular draw for people until it’s closure in 1907. It attracted thousands of visitors daily, despite being a slightly morbid form of entertainment. 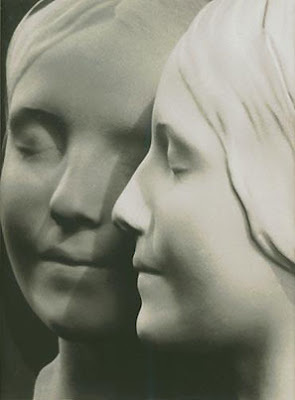 It is unknown if L’inconnue was publicly exhibited at the morgue. An assistant at the morgue was struck by her beatific smile and graceful beauty, her appearance so peaceful and serene it was almost as if she were asleep. He decided to have a plaster cast death mask made of her face. Death masks were made of plaster or wax. They were common as mementoes of the dead or for use in the creation of portraits. 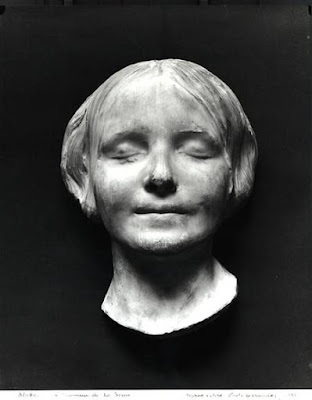 Her face, with a smile that suggests that she died in a moment of bliss, became a popular mask in French and German bohemian homes .The mask which was a popular objet d’art inspired many works of art and literature. Camus called her ‘the drowned Mona Lisa’ and she was mentioned by Nabokov and Rilke amongst others. Nowadays with modern techniques and science people argue that the story was fabricated and that the drowned woman never existed. A body taken from a river would not have had such clear and unbloated feature, and it was more likely that the mask was cast from the face of a young woman. According to other accounts, the mask was taken from the daughter of a mask manufacturer in Germany. The identity of the girl was never discovered. The moulder who took the cast of the face was believed to be based at the Lorenzi family model-making firm. Claire Forestier, a member of the Lorenzi family, believes that the model was not dead when the cast was taken. She works in the family modelling workshop, and says that a dead body from a river would not have such clear features. She estimated the age of the model at no more than 16, given the firmness of the skin. Regardless of what really happened her image inspired many and it has also saved the lives of countless others. Her face was used for the first CPR dummies 'Rescue Annie' and is perhaps the most kissed face of all time. Such an interesting story. This is why this blog is unique and always worth visting, it's full of amazing images and brilliantly concise stories behind those images. What an interesting tale. I really like the way you wrote about it. The important thing is the story though. Loads of times with stories the details don't matter, it's more about the underlying emotion. And I think this lady's face provokes loads of emotion. And you could put loads of different stories on top of it. And that's great. Thanks for stopping by today, thought I'd come over and say howrya. Expect long non-sensical comments from me from now on. Hope that's cool. Wonderful post. There's a quote from Sachaverell Sitwell (I think) which states "It is the mystery that endures, not the explanation", which this story reminded me of. Ah now you've gone and made me blush.That's really kind of you to say. I really like the quote,it can definitely be applied to this instance. How strange would it be if you were the German mask manufacturers daughter- thousands of people having your face hanging on the wall. Anytime :) Thanks for stopping by.